Updated December 9th, 2017: HCITracker has been renamed CPITracker, since the HANA Cloud Integration product name no longer exists. In some of my SAP Community blogs, I’ve highlighted ways we can look under the metaphorical hood of SAP Cloud Platform Integration. 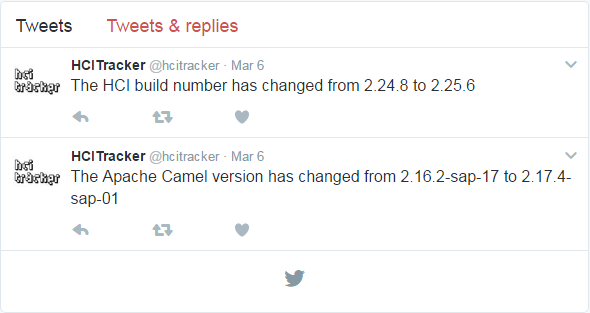 In this blog, for instance, I showed how to find the version of the underlying Apache Camel framework. In this one, I showed how to discover some interesting properties of the XSLT processor. In the shower (where else?) the other day, I had an idea: Tracking how these values change over time, would offer some interesting insights into how SAP Cloud Platform Integration is continously updated behind the scenes. As I add more, I will keep this blog updated. The tweets are posted by an Integration Flow running in my tenant. A Timer Start Event executes the Integration Flow at regular intervals. A couple of Groovy functions and an XSLT stylesheet extract the values I need, and Data Store operations are used to save and retrieve the values. Another Groovy function compares the previous set of values with the current set and extracts any differences found. A General Splitter then iterates over those differences, and each one is turned into the text of a tweet by yet another Groovy function, and posted to Twitter using the Twitter adapter.